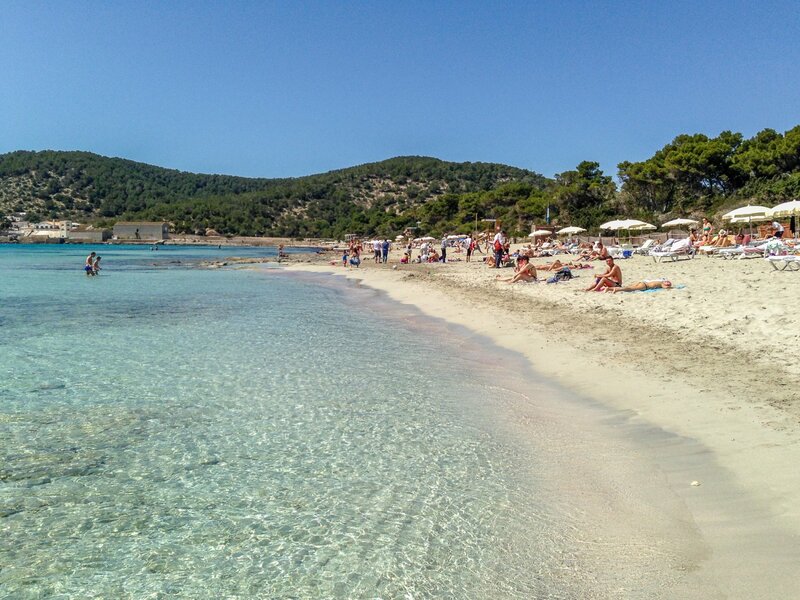 Ibiza Spotlight's featured beach of the week. The long strip of pale sand and crystal-clear waters that is Las Salinas beach combines Ibiza's glamour, a smattering of nudism and family-friendliness. Sitting in the island's south, this dreamy beach is within the protected nature reserve of the same name. You'll be mixing with the cool, the hip and the hippies - all attracted by the fun party vibe and the Balearic beats that pour forth from the many beach restaurants. You'll see a mix of the latest beachwear and floaty flower child style and you might spot the odd celeb poring over Vogue whilst sipping a strawberry daiquiri. With a south-facing position there's sun all day and lots of beautiful people to watch as you get your food, drinks or both delivered to you on the beach. Prices are a little more expensive, so pack a picnic if you are on a budget. You can learn to dive, splash along on a pedalo and if you need to stretch your legs, take a hike along the coast, going east, up to the pirate watchtower and back through the woods. You can get to Las Salinas by car or bus from Ibiza Town or Playa d'en Bossa. Follow the airport signs and then at the roundabout near the Hippodrome, take the turning to Salinas and follow the signs. For when you don't want the day to end, Boutique Hostal Salinas is a good value spot for cocktails and excellent evening DJ sets.